I took my first pretty bad fall on the skis today. It had nothing whatsoever to do with the dogs or with any sketchy hills, I just accidentally put a pole down on the inside of a ski which didn’t work out so well for me when that leg came back forward. I ended up eating snow, figuratively AND literally, since I pretty much fell flat on my face. I got a couple of bruises and a headache out of the deal, but am really none the worse for wear. It was warm enough today that the top layer of snow was soft and yielding enough to yield right up in my mouth, my nose, and under my sunglasses. There was nothing to do, really, but just get back up and “ski it off”. I was about halfway out on a 3.5K loop so whether I turned back or kept going it was a wash and I wasn’t really hurt anyway, just a little shaken up. And as we got moving again and I mentally reviewed my “helmet while skiing” policy (admittedly pretty lax this year) we left it behind us and had a good rest of the run. Which made me think about other things I should really leave behind. After the Loppet, I decided I needed to just relax and not care how perfect the dogs are on our runs. 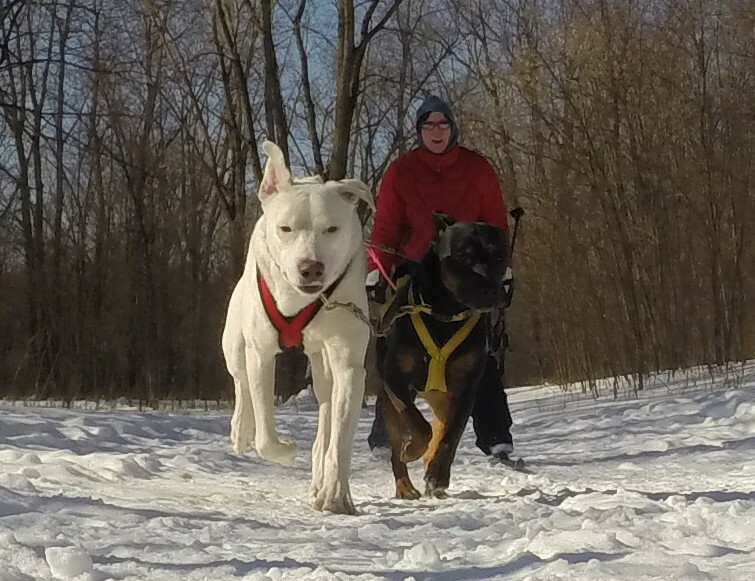 Not that I want them to stop constantly because that’s annoying, but before the Loppet I had gotten pretty obsessed with ON BY perfection and in retrospect it was probably as aggravating for the dogs as it was for me. So I have just decided that if they occasionally find a particular tree irresistible then so be it, it’s not the end of the world. And a couple of things have happened since making that decision: 1. They (and by “they,” I mostly mean Squash) are actually stopping less. Like, a LOT less. And going ON BY better. Like, WAY better. Including not really caring about the Original On By Tree anymore (although there is an On By Fallen Tree and a Usurper On By Tree farther down the loop) 2. I am having WAY more fun. And I’m realizing that I was probably creating, or at the very least contributing to, a horrible feedback loop of being annoyed, nagging, and being ignored for nagging. How freeing for us all, to loosen up my expectations a bit without letting things become a free-for-all.